Read the Stories from 2015 . . . Become Inspired! Hi Gary. Thank you so much for the "pay it forward" gift card. It was one of the best gifts we have ever received! Through assistance from our veterinarian, we found a deserving family that is struggling financially. The gift card will be used for them and their pets. Thank you again for giving us the privilege and means to "pay it forward". It brought us great joy. Merry Christmas to you and your family and all the staff at Williams Asset Management. Thank you for the opportunity to continue what has become a tradition for me! For the last 2-3 years my company has done a "know your numbers" campaign where if you completed a health survey and participated in the company physical you would be rewarded with a monetary gift card. This year we are still able to participate in the "know your numbers" campaign but no more gift card. I have been anonymously donating these gift cards to our porter, who lives alone, having recently lost his long-time companion, has a few health issues and I suspect just barely makes ends meet. I was so delighted to recieve this gift in the mail so I can continue my tradition in the hope his Christmas will be merrier. I picked up a flier today titled "Adopt A Grandparent For The Holidays." A local woman is assembling gifts of hand lotion, foot cream, and other goodies wrapped for the holidays and delivering them to Pleasant View Nursing Home in Mt. Airy, MD, in December. Each gift is to be personalized with the first name of a donor so the grandparents feel loved and special. We visited the nursing home today and gave our gift card to Lisa who is assembling the gifts. Five of our grandchildren will be the donors of the gifts and they will be drawing holiday cards to go with the gifts. Although we won't be able to see the grandparents as they receive their gifts, we hope the gifts and cards will help them feel special at this special time of year. It was wonderful meeting with Lisa and helping her meet her goal of having gifts for each of the 98 residents of Pleasant View. My husband and I are volunteers at a Food Pantry and we come in contact with needy people throughout the year. About two years ago we met a couple who became special to us. Pat and her husband are now in their sixties. They are just normal people who worked all their lives just to have a normal life with a few frills; but then Pat's husband at the age of 50 suffered a severe heart attack and came close to death. Their insurance ran out and they had to start paying for medical bills out of pocket. Pat's husband continued to have severe heart attacks through his fifties and never could return to work. With no insurance and continuous medical bills, Pat continued to work but was just able to pay medical bills. As a result, they have mortgaged their home to continue just living. Now, they exist on Pat's social security, as her husband is not 65 yet. Pat can no longer work due to poor health and her husband is legally deaf so Pat is his ears as well. They now spend their "golden years" sitting in lines weekly to collect food support. I have noticed how happy they are with big smiles when they accept donated deer roasts fresh vegetables from the Food Pantry. They especially cherish any extra items like tea, sugar, desserts and fruits. Things they cannot afford to buy. Despite their problems, Pat and her husband continue to do household chores for their neighbors who are not as well off as they are. They are proud, self-reliant people but they need some help. When I gave the gift card to Pat and her husband they were surprised and thankful. There is no doubt the gift will be put to good use for either themselves or their neighbors. My husband and I were delighted to share some good fortunate with two very deserving people. The church I belong to (Holy Redeemer by the Sea Catholic Church) at this time every year selects Families that are in need of the basics and helps to provide them with basic items that will make their lives a little better. I gave them the gift card (and added some more) so that some Family less fortunate could at least have a little JOY this Holiday season. I want to THANK Gary and all the staff at Williams Asset Management for providing me with a reminder that we need to help those who are less fortunate than we are. By you sending me the gift card it got me to add to it and hopefully make a Family's Holidays a little brighter. THANKS AGAIN FOR HELPING ME HELP OTHERS. We decided to show our appreciation to an older gentleman who works at the entry kiosk of the Alpha Ridge landfill in Ellicott City. He greets all Howard County residents with a warm smile and a wave of the American flag. He said he works 2 days a week and enjoys the contact with the public. We noticed on the day we gave him the "Pay It Forward Card" that he uses a nasal cannula that is attached to an oxygen tank. He was so surprised and gratified when we gave him the card; we thanked him for making our landfill visits a nice experience. He wished us a happy holiday as he continued to greet the landfill users on a bright Dec. 31 morning. I work for my church's thrift store. In my state these stores are very popular and have some very high end items donated. Yesterday a woman came in asking me to put a sofa on hold for her. Her brother had been in earlier and loved it. She had to wait until her ss check came in to buy it. Her brother has lymphoma that is spreading to his bones. He lives on $800 a month. I told her to come back later that day with him. Turns out he is a war veteran also. He not only wanted the sofa, but asked about the matching love seat. I reduced the price for the two and took another hundred off. They couldn’t believe it. They were so happy they could afford both pieces for this suffering, dying man. They were so grateful. The woman came back later and thanked me for making her brother so happy. I was almost in tears and was overwhelmed myself over their appreciation. This act of kindness not only helped a suffering man, but also the thrift store whose profits go to underprivileged children getting a Catholic education. With the gift card in hand, I visited the Salvation Army store in Laurel, MD, just after Christmas. A young woman was kneeling on the floor helping her 4 year old daughter try on some used pink winter boots. Her even younger son was watching patiently. I could see her hesitating and realized I found the perfect person to Pay It Forward to. When I handed her the card, she had difficulty understanding what it meant since Spanish was her first language. She called over her sister and I explained that I was simply passing on my good fortune and wanted to help someone randomly. The look of gratitude made my day and I wish I could have heard the conversation between the two sisters after I left. Great idea using the gift cards and we love 'Pay It Forward'. We are building a home in TN and have been hiring various tradespeople to do the finish work on the inside. Some of the longer lasting projects have given us a great opportunity to get to know many of the workers we've been blessed with. One such person was the lead painter in a group of Hispanic painters. Tomas is the only English speaking worker and as I described specific things that needed to be addressed during the painting process we got to know each other quite well. Always polite and very considerate, I felt blessed to have such a sweet man contributing to the development of our home. Just a few days after the gift card arrived, I noticed Tomas did not come to the house with the rest of the crew. All I could get out of the other workers was that he just wasn't here today. I immediately knew something was not quite right and my concern grew as the day went on. A few hours later I had the opportunity to speak with the owner of the company and he informed me that Tomas' house had completely burned down the night before, leaving his family of 6, with four teenage children homeless, just days before Christmas. There was no doubt in my mind that we needed to help his family get back on their feet and was thrilled to have the additional funds in the form of the gift card to give to Tomas. Thanks so much Gary, for the gift of giving is as wonderful for the giver as it is the receiver. Blessings to you all! The small town we live in looks ideal and has even been credited with being the vortex of harmonious energy. Visitors come for shopping, history and hiking. However, "invisible" problems reside here as well. Since my husband and I had no knowledge about the families who might need some assistance at this holiday time, we did the next best thing. The minister of the local Presbyterian church, who is active in many organizations and is a dynamic community leader, was consulted. Without any hesitation, he assured us that the Pay it Forward card would be passed along to a family who could use the help. Thanks to Williams Asset Management for their generosity and foresight! We came across the need for financial help with a 50 year old divorced mother. She had a double mastectomy during the summer followed by chemotherapy. She has had very limited income and won't be able to work full time until the spring. She was very appreciative of the gift card and said “The money will be very helpful with food and prescriptions". She also said "To thank the man and his company for doing this." Several weeks before the holidays s news story ran in our local paper....the Richmond Times. It was about a family of 11 living in a two room trailer on the Southside of Richmond. The father had lost his job and the mother and father along with 5 young children moved in with her mother and father who owned the trailer. The reporter went on to say that there was not a lot of money for Christmas presents for the children. I was so taken by this story that I called the newspaper....talked to the reporter who put me in touch with the charity organization trying to help the people in this area. The charity organization gave me the name and address of this particular family. I was so happy to send them the gift card. I included my email so I could make sure the nail went through and sure enough the family got back to me immediately. They were so happy to receive the gift card and felt it could help put a little joy in Christmas for their children. Thank you Williams Asset for "Paying it Forward". What a wonderful thing to do. What a wonderful idea for a Christmas gift! I had a lot of fun thinking about what I might be able to do with the money. I ended up cashing the gift card and giving the cash to a young mother from El Salvador who works three jobs to make ends meet for her and her children. She has no health insurance and struggles financially, but she never complains and is always smiling. What an inspiration she is to me. I was delighted to be able to surprise her with this gift, and she was very grateful. Thank you Gary, Nick, Shelly, Maureen, and everybody else at Williams Asset Management for your thoughtfulness and kindness in allowing us to pay it forward. I first want to thank Williams Asset Management for such a generous thing to do. We provided the card to a friend of a friend – an 86 year old lady that was struggling financially. After getting her address from our pastor, we went to her house to deliver the Pay It Forward card. Initially, she would not take the card. She had too much pride to accept it. After spending about an hour with her; explaining that we have been blessed with this card and we want her to be blessed as well, she finally accepted it. Unfortunately, we found out that the next day she broke her hip and died in the hospital a couple days later. We were able to connect with her children to tell them about the card and they gratefully let us know they would donate it to a local charity that supported her over the years. We have supported a no-kill animal shelter in Mecklenburg County, VA for the past few years. This is a rural community that doesn't have much in the way of resources for lost animals, but the Lake Country SPCA does a great job to save animals and try to place them in new homes. We decided to donate much needed supplies including dog food, kitty litter, collars, and leashes to them using the gift card. The shelter greatly appreciates the generosity of Williams Asset Management. I work in a church located in a working-class Jersey Shore community, many parts of which are still struggling to recover from the 2012 aftermath of Hurricane Sandy. Although people have been able to (mostly) repair their homes, many of these were later informed by the municipalities or their insurance companies that they must have their houses raised in order to continue to qualify for flood insurance or any further government assistance. As a result, they must vacate their homes for weeks or months at a time. When they find themselves with no place to go, they often come to us. One individual, William, found himself in this situation. Although not the owner of the property himself, his landlord told him that he would have to find another place to live for the two months that it would take to have the dwelling raised. With the "Pay It Forward" gift, we were able to get him short-term stay at a local establishment, which provided him with the much-needed time to make arrangements for a place to live until his house is again available. Thanks for the great way of helping others! Not being permanent FL residents but "snowbirds" from VA for the last several years, we aren't totally familiar with the area and have been concerned over how best to use the "Pay it Forward" gift locally in FL. A friend and neighbor down here (FL) knows a person that works with an organization helping local needy families and individuals in many ways. We inquired about her program and were put in touch with the Society of St. Vincent De Paul, a Sacred Heart Conference organization. We discussed how we could help them best and decided to contribute the gift card to their scholarship fund that helps many individuals seek higher education to improve their lives. We were informed by the program leader that the likely recipient of the gift card is a survivor of domestic violence with several children and is working on a degree as a registered nurse. Thank you for the "Pay it Forward gift. It was not easy for us to determine who to share this gift. I play in a local pool league and last session our team welcomed a new member who was looking for a team to join. The new member happens to be a member of the US Army with a fantastic outlook on life. Toward the end of January he received orders to move to North Carolina. We chose this young soldier to share your "Pay it Forward" gift suggesting he take his wife to dinner on us when he gets settled at his new post. Seeing the surprise in his eyes was the best gift of all. Again thanks for this unique gift. We have come to know a young man who is studying here in the U.S. From Nigeria and is playing basketball at Milligan College in Johnson City, TN. He is all alone in this country and when we met him he didn't really even have clothes that fit him (he is 6'9"). We have been trying to help him as best we can, even though we aren't as in close proximity to him as we once were. This card will allow to buy whatever he feels he needs as opposed to us picking something. Ike is quality kid and has been a role model for our boys who have bonded with someone who is from a totally unique culture and background. 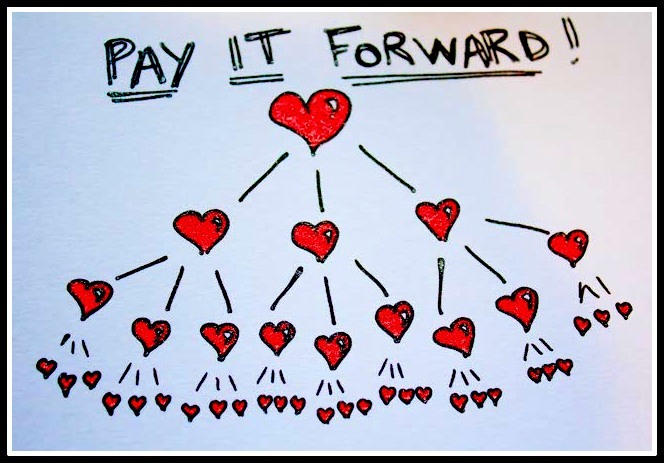 Thanks to WAM for the Pay it Forward concept, it makes a difference. Thank you, Gary. Your donation was sent to M.L., who was severely wounded during combat in Iraq. Semper Fi! Our story may not be quite as endearing as the example but we tried to use the money where we knew it would be needed. We volunteer at the Route 1 Day Resource Center. We are generally stationed in the shower/laundry area and have noticed that there is never enough shower supplies like deodorants, Q-tips, razors, toothpaste and the like. These are things we may take for granted but for the people who come to the shelter they are necessities that they can't easily obtain. To help fill that need, we used our money to buy supplies for the shower cabinet, hoping to help those in need at the shelter. Hopefully we can help a little in this difficult time of year for those who are homeless. We gave our card to our Parrish to use as they decided to help others with the most urgent needs. I checked with a friend who is Office Administrator at our church and explained that I had been given a gift card to share with someone in need and asked if she had any recommendations. After a couple minutes, she told me a young family had been recently attending regularly and the wife had recently lost her job and they were struggling financially and she felt they would be most appreciative of the anonymous gift card. Thanks for sharing a wonderful gift to pass on to someone in need. Thank you Gary for a wonderful surprise gift to share with someone less fortunate. I talked to our Church Administrator and asked if she knew someone who was really struggling that would benefit from your Pay-it -Forward debit card and she was aware of a young family where the mother had lost her job that could really use some help. I gave the card to the Church Administrator to give to this family anonymously. She later reported to me that the family was very appreciative of this unexpected blessing.